Celaena Sardothien is an assassin, probably the best in her country. Except for one small detail. She got caught. Having spent a year in the salt mines of Endovier, she gets an opportunity to win back her freedom. Become the King’s champion, work for him for five years, and walk away a free woman. But with a mysterious and vicious killer on the loose, determined to wipe out all the potential champions, winning back her freedom isn’t as easy as Celaena had thought it would be. I had added this book to my to-read list a long time ago, but I never got to reading it, even though a lot of people absolutely loved it. When I got a VVV cheque for my birthday, I decided to go to the Waterstones store in Amsterdam and there I finally bought Throne of Glass. I fell in love with the cover, because it just looked absolutely gorgeous! When I started reading the book, I felt like I was rereading Poison Study. In a land ruled by a man who got his power by killing the royal family, where magic is forbidden, a murderous girl gets a chance to earn back their freedom. They have to do dangerous things (participate in the competition/become the general’s food taster) and risk being killed or send back to their prison each day. There is also a (part of the) country that is still not in the hands of that important person, but they are trying to make it theirs. But other than that, the stories were also quite different from each other, and I enjoyed both of them a lot. First thing I noticed about this story was the map. I L O V E maps in books, especially if it’s a fictional country. This helps me imagine the world they live in better, and I found myself flipping back to the map in the front of the book very often to see which city or country they were talking about. I once made a post about how much I love books in maps, and this always gets the book an extra point! While the story was mostly about Celaena trying to become the King’s champion, we didn’t read a lot about those tests she was supposed to do. I had hoped to read more about those tests, though they might have been simple, that was what the story was supposed to be about. Of course, there was another story line that was going on, the murders of the champions, but still the author could have cut some of the romantic parts and added more of the testings, in my opinion. Which brings me to the next part, the romance. Yes, there is romance in this book. At some points, I actually felt like there might have been a love triangle, which is something I despise. I can’t really say I ‘ship’ the two, maybe after reading the second book in the series. If there isn’t going to be another love interest of course. I kind of felt like Sherlock Holmes, trying to solve the murders before they were actually solved in the book, and I personally think I did a very good job. The first person I suspected ended up being the one who had caused everything, but to me it had been kind of obvious (though some things in the story made me confused). I liked the characters, but there was only one that I really loved. Nehemia. She was an amazing friend to Celaena and she made me so happy every time. There were parts where I actually suspected her of all the murders, but I think I suspected every character in the book at some point. Anyway, she was just such a lovely person and it made me happy every time I read about her. I thought this book was very well written, only I would have loved a little chart that taught you how to pronounce all the names, because that is one thing I don’t like about fantasy novels, the difficult names that you think are pronounced like this, only to find out that they are pronounced like that. 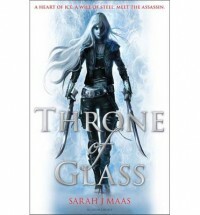 In the end, I enjoyed Throne of Glass a lot, and I will definitely be checking out the rest of the series! I recommend this book to you if you love fantasy with an awesome heroine, and especially if you loved Poison Study (because even though the story sounds similar, they are both amazing in their own way)!